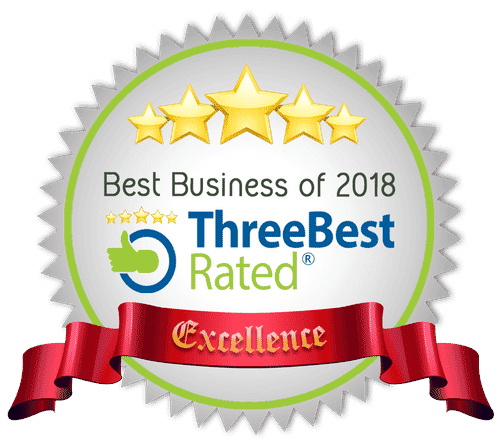 Click Here to view our reviews on Google. One reason why the public hires a lawyer to handle their divorce, is because lawyers are bound by the Texas State Bar Licensing rules for advertising. Lawyers are not permitted to post or obtain fake reviews. Our reviews are genuine. This is my 3rd divorce and by far my best experience. Megan Cook returned my calls and messages immediately. Every thing I asked for was granted. Everything is explained clearly and in writing. A lot cheaper too than my previous divorce. 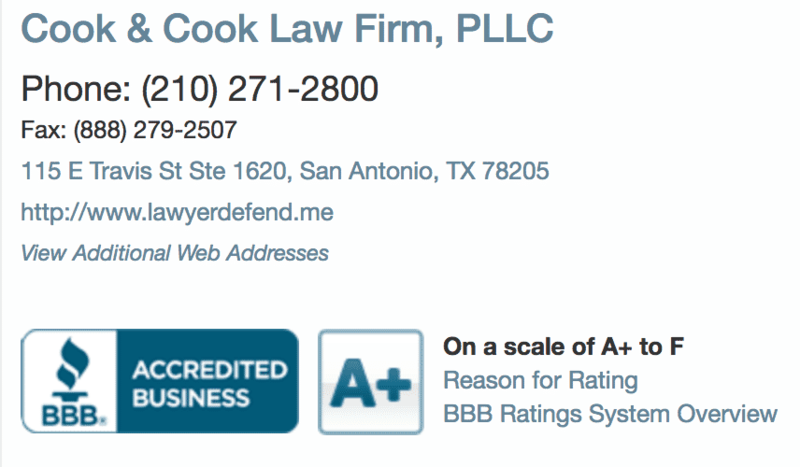 I wanted to thank you, Mr. Cook, and the rest of your team for helping me with my divorce. I know it took awhile for me to get everything done and I am grateful for your patience and your communication with me the past six months. I will definitely be returning to you if I ever need you and will refer anyone I know that is in need of legal assistance. 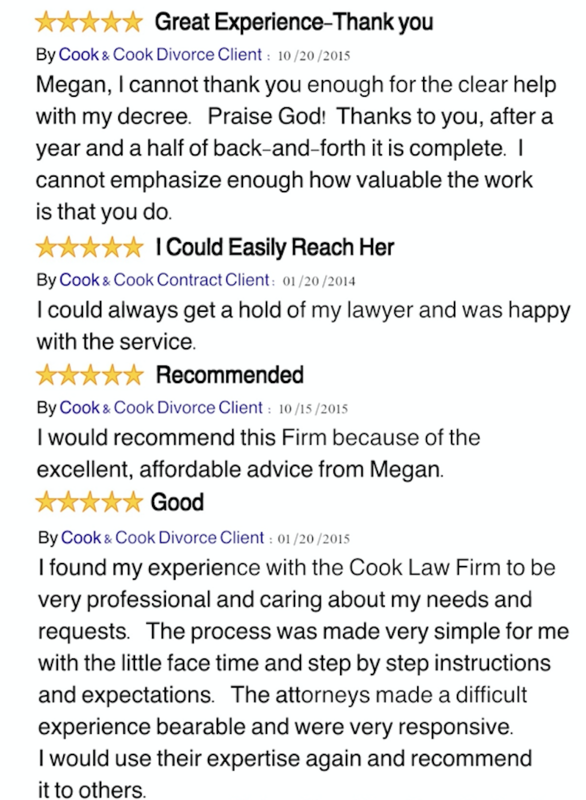 I recently filled for divorce and selected Cook & Cook attorneys to help me thru the process. I started my process online which was followed up with a phone consultation where I was told exactly what to expect. The changes that came were from my side of the divorce otherwise the Cooks did what they promised AND much more. I cannot explain how happy I am with the service they provided. The Cook’s were always available to answer my questions, calls and emails in a timely manner! The day of my court date we were in and out in under 15 minutes. 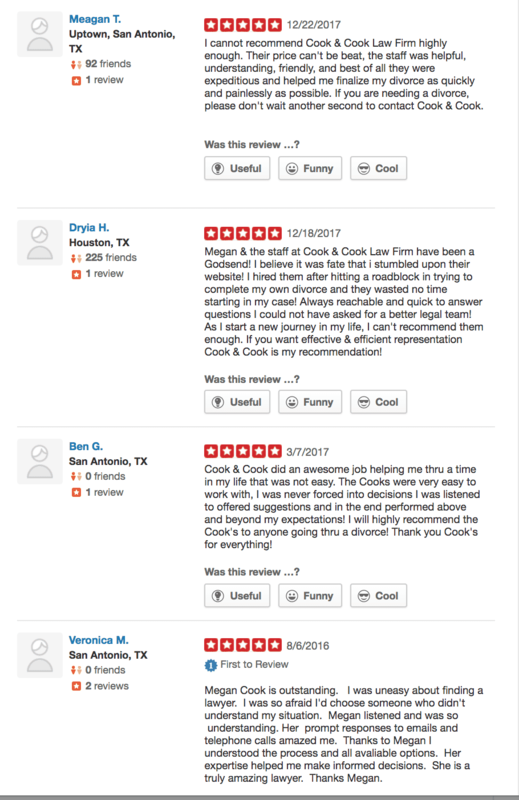 I will definitely recommend the Cook’s Law office to anyone who needs a divorce attorney. Thank you Cook & Cook for making a not so pleasant time in my life less painless. Megan Cook is outstanding. I was uneasy about finding a lawyer. I was so afraid I’d choose someone who didn’t understand my situation. Megan listened and was so understanding. Her prompt responses to emails and telephone calls amazed me. Thanks to Megan I understood the process and all avaliable options. Her expertise helped me make informed decisions. She is a truly amazing lawyer. Thanks Megan. Everyone I have encountered at Cook & Cook has been simply incredible. I can't give enough thanks to Angie who has helped me along this process and has continuously checked up on me. The service this law firm provides is simply out of this world. I can't thank the staff at Cook & Cook enough! We appreciate these kind words soooo much! Thank you, Victoria. This is my 3rd divorce and by far my best experience. Megan Cook returned my calls and messages immeditiately. Every thing I asked for was granted. Everything is explained clearly and in writing. A lot cheaper too than my previous divorce.